For most home and small office users, reviewers say that Canon flatbed scanners are your best bet. However, if image quality is what matters most of all, go with an Epson. Fujitsu makes the best sheet-fed scanner for the office. Experts and owners agree that the Canon CanoScan 9000F Mark II is one of the best all-around scanners for the money. This 9,600-dpi flatbed scanner produces sharp, accurate photo scans with excellent color quality, and it can also handle slides and negatives. Scan speeds are fast, and most owners find the scanner easy to use. The Canon CanoScan LiDE 220 offers a lot more functionality than you'd expect from an $80 scanner. It can scan documents and photos at up to 4,800 dpi, and it provides basic options for touching up images, such as color correction and dust removal. It's also lightweight and compact, and its OCR software does a good job of producing searchable documents. With excellent performance, solid build quality and a deep feature set, the Fujitsu ScanSnap iX500 is a beast of a document scanner. This speedy sheet-fed workhorse has a 50-sheet automatic document feeder (ADF), can scan in simplex or duplex mode, and can scan to mobile devices and computers via Wi-Fi. It also offers highly accurate OCR. For professional photographers and others who need high-quality photo scanning, experts say the Epson Perfection V800 Photo is the scanner to get. It has two lenses, so it can switch between 4,800 dpi resolution for photographic prints and 6,400 dpi resolution for slides and film. It also works fairly quickly, has a good selection of image-correction features, and supports most film sizes. Scanners come in many shapes and sizes, but flatbed scanners, in which you place the objects on a flat "scanbed" and close the lid before scanning, are the most common type. This design works for a wide variety of media types: loose documents and photos, bound material such as books and magazines, and even three-dimensional objects, if they're not too bulky. Since you don't have to put anything through a document feeder, flatbed scanners are the best for protecting easily damaged materials, such as stamps or irreplaceable family photos. If you need to archive lots of unbound pages and documents, it gets very time-consuming to constantly lift a flatbed lid and scan one page at a time. For jobs like these, a sheet-fed document scanner is a better option. 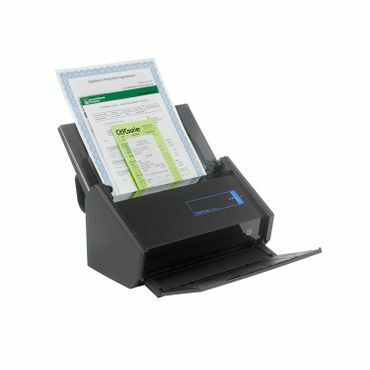 A sheet-fed scanner lets you insert pages one by one, without the extra step of lifting and lowering the lid. Many have the convenience of a built in automatic document feeder (ADF), which can churn through an entire stack of paper without user intervention. Many sheet-fed scanners also have duplexing capabilities, which means that they can scan both sides of a page that's been fed through once. If image quality is the absolute chief concern, you'll need to shell out significantly more cash for a professional-grade photo scanner. Photo scanners offer higher optical resolution than typical multipurpose or document scanners. Many also include premium features to help improve scan quality, such as automatically editing out dust and scratches. However, unless you're a photographer or graphics professional, a dedicated photo scanner might be overkill for your needs. In recent years, standalone scanners have taken a back seat to multifunction printers (MFPs), also known as all-in-ones. These devices combine the functions of a scanner, printer, copier, and sometimes even a fax machine in one unit. According to PCMag, the choice between a scanner and an MFP comes down to your personal scanning needs. If all you ever need to scan is letter-sized, single-page documents – with perhaps the occasional longer document or book page thrown in – then an MFP is probably the better choice, and we cover some great alternatives in our report on multifunction printers. However, those who frequently scan multi-page documents, or need a high-resolution scanner for photos, artwork and, especially, transparencies such as negatives or slides, will find a stand-alone scanner to be a better option. "The Best Portable Document Scanner"
Scanners range in price from as little as $60 to more than $1,000. To help you find the scanner that best fits your needs and budget, ConsumerSearch digs through expert reviews at sites such as PCMag, Wirecutter, TechRadar and others. These reviewers have broad expertise when it comes to scanners, and are able to identify top performers and top values for any use. User reviews, however, are just as important. We look at sites like Amazon, B&H Photo, Staples and others to see how well scanners perform in the real world -- where issues that don't come up in short-term expert testing may become apparent, and usability concerns that experts may overlook, but that can plague users, may surface. Based on all of that feedback, scanners are evaluated on the quality of the scans they produce, of course, but also on their speed, ease of use, and overall reliability. Flatbed scanners are the most common type of desktop scanner. They're also the most versatile and are ideal for multipurpose use. The combination of a scanbed and a top-opening lid can accommodate bulky objects that won't go through a document feeder. Flatbed scanners can handle both documents and photo prints, but you'll have to pay a bit more for one that can scan photographic slides and negatives. As long as your scanning needs are modest, experts say there's no need to spend more than $200 on a general-purpose flatbed model. The best flatbed scanners combine great performance, ease of use, and a wide range of features, along with a useful software package. Overall, the Canon CanoScan 9000F Mark II (Est. $170) is the best value we've found in a multipurpose scanner. Wirecutter recommends it as the best low-cost scanner that can handle printed photos, negatives, and film. Despite its relatively low price tag, the CanoScan 9000F Mark II can scan photos and artwork at resolutions of up to 4,800 dots per inch (dpi). For film, its maximum resolution is an even more impressive 9,600 dpi. Reviewer Lizz Schumer of Wirecutter describes images produced by the CanoScan as clear and beautiful. She notes that the scanner automatically sharpens images and corrects colors, and with a little more work, it's possible to edit out dust, scratches, and "gutter shadows" (the dark areas that appear between pages when scanning a book). The CanoScan 9000F Mark II is also the fastest printer in Wirecutter's tests. It takes about 5 seconds to scan a black-and-white page at 300 dpi, 11 seconds for a full-color page, and only 6 seconds for a small color photo. The scanner offers the choice of an Auto Scan mode, which recognizes, crops, scans, and saves an image with a single click, or advanced mode, which lets users make additional adjustments to brightness and contrast before scanning. User reviews at Amazon and B&H Photo back up Schumer's findings. Owners say the CanoScan 9000F Mark II is fast, delivers clear images with accurate color, and warms up almost instantly. However, not all users are happy with the Canon software package. Some say the ScanGear program, used for adjusting pictures in manual mode, does a poor job of making fine adjustments such as color balance and exposure, and others found the My Image Garden program for organizing and storing photos very awkward to use. Schumer considers the Canon software "serviceable" but says it's no substitute for the Adobe Photoshop Elements software that comes bundled with some competing models – a $100 value. Although the CanoScan 9000F Mark II produces very good images, it didn't have the best image quality in Wirecutter's tests. That honor belongs to the Epson Perfection V550 Photo (Est. $170). 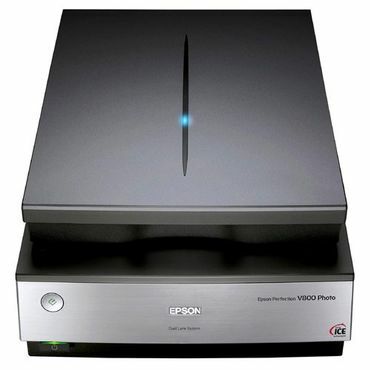 This Epson scanner's features are fairly similar to the Canon's; it can scan film, slides, and negatives as well as prints, and it has digital image correction and enhancement (ICE) for editing out dust and scratches. Also, like the Canon, it has an LED bulb for instantaneous warm-up. However, its optical resolution of 6,400 dpi makes it capable of reproducing photo prints even more faithfully. 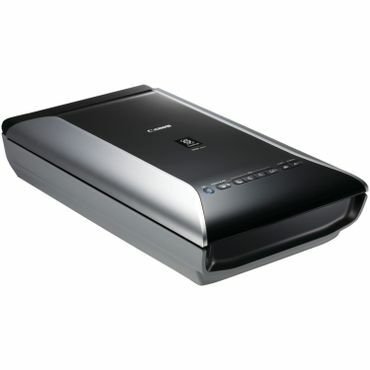 Also, unlike the Canon, the Epson Perfection V550 can upload scans directly to Facebook and other cloud-based services. Unlike the CanoScan, the V550 doesn't automatically touch up images to make them clearer. This means its images are incredibly accurate, but the downside is that any necessary adjustments have to be made by hand. Moreover, Schumer found the V550 harder to use. The first unit she tried never worked at all, despite hours of fiddling and a call to customer service. Once she got a working replacement, she began to have problems with the software, which she said was "very confusing" and "required a lot of trial and error," even when she followed the instructions in the manual. In addition, the V550 is significantly slower than the CanoScan, taking about 15 seconds for a black-and-white page, 20 for a full-color page, and 25 for a photo. Users at Amazon and B&H Photo have similar complaints, and several say Epson's quality control isn't the best. Moreover, owners find Epson's technical support incredibly unhelpful. However, they admit that the scanner's image quality is great, particularly for negatives. Reviews on the setup process are mixed; some owners found it incredibly easy, while others couldn't figure it out at all. Both the Epson and the Canon are backed by a one-year limited warranty. If all you ever need to scan is text documents and the occasional batch of photos, then you can probably find a scanner that meets your needs without spending a lot. Cheap flatbed scanners, priced at $100 or less, can handle these basic scanning jobs, but they typically can't scan film or negatives. Resolution on budget scanners is often lower than on their pricier cousins, but some can reproduce images at 4,800 dots per inch (dpi) – the same as our top-rated flatbed scanner, the Canon CanoScan 9000F Mark II (Est. $170). Also, these budget-priced scanners don't always come with as complete a bundle of software. 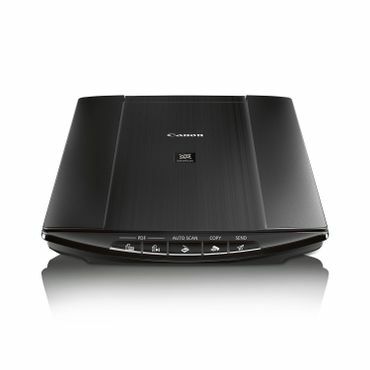 In this price range, the scanner that earns the most recommendations is the Canon CanoScan LiDE 220 (Est. $80). It can do just about everything the CanoScan 9000F can do, with the exception of scanning film and negatives. It produces high-quality photo scans, with a maximum optical resolution of 4,800 dpi. It also provides basic image-enhancement options, such as color correction and dust removal. Reviewers at Wirecutter and PCMag say it consistently produces clear, sharp images for all types of materials, although purists may be displeased with its tendency to automatically sharpen photographs. It's also not as fast as the pricier Canon scanner, taking about 10 seconds for a black-and-white page, 14 seconds for a color page, and 20 seconds for a photo. The LiDE 220 offers you a good range of options for formatting and storing your scans. It can convert documents to searchable PDF and editable text formats, and reviewer Lizz Schumer at Wirecutter says its optical character recognition (OCR) is fairly accurate. It sometimes runs into trouble with unusual or extra-small fonts at first, but they usually come through correctly on a second pass. The LiDE 220 is also capable of sending scanned documents to the cloud, but you have to install the appropriate software on your computer to do that. Both Schumer and M. David Stone of PCMag note that the My Image Garden software that comes with this scanner is extremely limited, with very few options for editing your photos. The CanoScan LiDE 220 is lightweight (just 3.4 pounds) and fairly compact. One nice feature is that you can store and use it in an upright position, so it takes up less room on your desk. It's powered via USB from a host computer or laptop. Some users like this feature, since it eliminates the need for a power cord, but others dislike having the scanner tethered to their PC. Also, like the more expensive Canon, the LiDE 220 gets many complaints about its software, which some owners find complicated and clunky. We also saw reports from both Windows and Mac users that say they couldn't get it to work with the latest versions of their operating systems, though others report no problems in that regard. Most users praise the scanner's easy setup and great image quality. It's covered by a standard one-year warranty. Another strong performer in this price range is the Epson Perfection V39 (Est. $80). It matches the CanoScan LiDE 220 in terms of optical resolution, and it's roughly on par in terms of speed – slightly slower for black-and-white documents, but slightly faster for photos. Like the Canon, it's lightweight, can be used in a vertical position, and requires only a USB cord for power. It also comes with the same limited one-year warranty. Stone, in his review for PCMag, actually prefers the Epson Perfection V39 to the Canon, saying it does slightly better on text recognition. However, Schumer, who tested both machines on both Windows and Mac systems, could not get the OCR to work with a Mac. She also said the Epson's scans "weren't as eye-pleasing" as the Canon's, and she found its unlabeled buttons confusing and "finicky" to use. Users who review the Epson Perfection V39 at Amazon and other retail sites like its compact size; many users even describe it as "portable," although it's not designed for travel. They also say it's easy to set up and produces good images. However, several users complain that the scanner is too slow and doesn't offer good options for organizing your images. We also saw a few complaints about reliability, particularly from Mac users who couldn't get the software to work with their machines. High scanning and processing speed.